eFACiLiTY® - Space Management module that helps in ensuring effective and efficient use of space available in a facility. 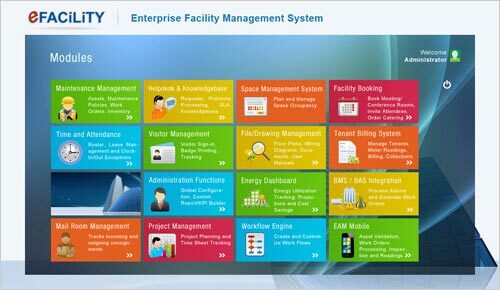 eFACiLiTY® - Space Management System helps in tracking the space available in the facility and allocate space to departments and employees in an efficient manner, track occupancy for utilization analysis and reporting, help in department or project or account wise charge back and accounting leading to an efficiently managed space. The ability to manage the space by visualization of floor-plans by importing AutoCAD drawings, visually allocating space and display of utilization analysis dashboard augment the user friendliness multi-fold. eFACiLiTY® - Card Management System helps to manage the creation, issuance and tracking of badges and passes to employees, contractors, daily visitors like drivers of employees, etc. eFACiLiTY® - Travel Requests Management helps the travel desk to track and manage all travel related requests like air ticket reservation, visa processing, foreign currency purchase, hotel reservations, car rentals etc., handle approval processing and raise orders to vendors. 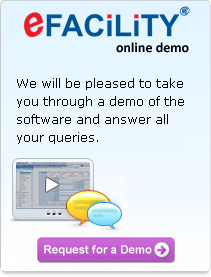 eFACiLiTY® - Project Management module provides an integrated system for maintaining Project details, Time and Attendance details of all employees. This application has the provision to perform the daily attendance and time sheets, project details and to generate the analysis reports. The project can be defined with start and end date, estimated hours and Resource Allocated. The project Status can be viewed instantly with Hours consumed so far and Projected Hours. The tasks can be defined with Task Category, Task Status, start and end date, estimated hours, Resource Allocated and Predecessor for respective projects. Task Summary, Current Overrun and Projected Overrun can be viewed in dash board.